I mentioned quite a bit that I take a lot of inspiration from chefs/restaurants. I love being able to pull different flavors and ideas from those meals then use those to make an everyday recipe. Sometimes, however, the everyday meal stems from the takeout, the guilty pleasure. I have a weakness for Americanized Chinese food but my one complaint is that it never has enough vegetables for me. The ratio is usually 10 parts rice or noodles to 1 part vegetables. 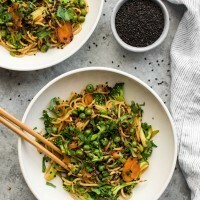 This vegetable lo mein is my rendition that flips the ratio to be heavy on the vegetables and lighter on the noodles. The best part, you can easily play around with different vegetables, leaving out ones you might not have on hand. Cook lo mein noodles according to package. Drain, rinse slightly, and toss with 1 teaspoon sesame oil. Heat a wok or large skillet over medium-heat. Add the sesame oil followed by the scallions, broccoli, and carrots. Cook, stirring occasionally, until the broccoli and carrots are starting to soften. Add in the peas, cooking for 3 to 4 more minutes, or until everything is tender and starting to char slightly. Add in the garlic and ginger, cooking for a minute more. Next, add the cooked lo mein noodles to the skillet and cook for a couple minutes, just to lightly fry the noodles. Stir in the cilantro and sesame seeds. Finally, in a small bowl, whisk together the ingredients for the sauce. 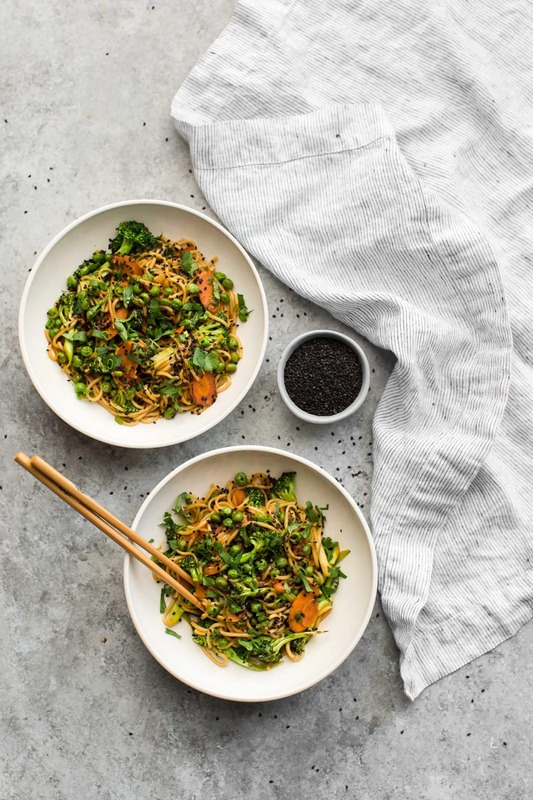 Add to the cooked vegetable mixture, cook for one to two minutes just to warm the sauce, and serve with extra sesame seeds and cilantro. 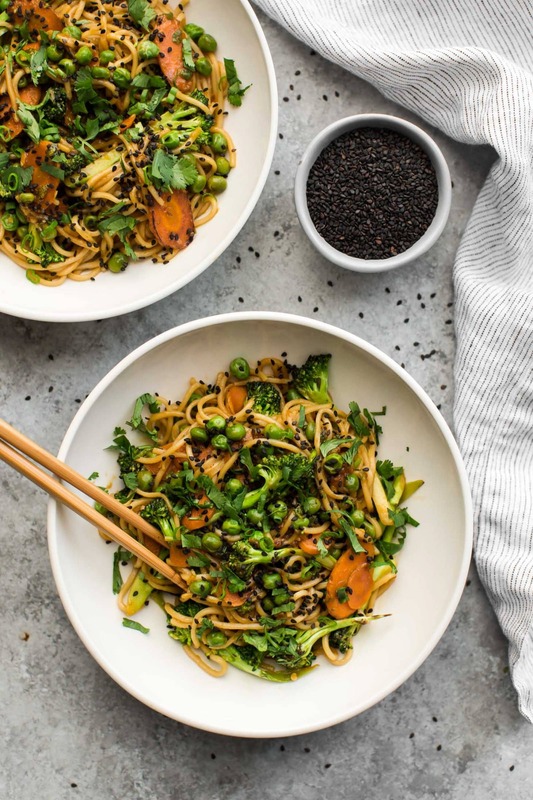 When it comes to this vegetable lo mein, the only thing I’m fairly adamant about is that you find lo mein noodles. These wheat noodles have the perfect texture in a dish like this and aren’t really replicated in a stand-in (as some my suggest spaghetti- it works, but I wasn’t really in love with it). Vegetables: As noted in the introduction, you can really play around with the vegetables. I like this to be a clean out the refrigerator kind of meal when the carrots and broccoli might be on their last day. A few other good vegetables to use: snap or snow peas, sweet potato, green beans, or zucchini. Spice: Sriracha will work in place of the sambal oelek. 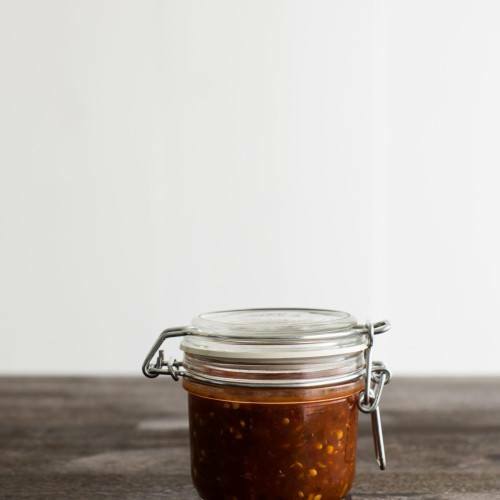 Sauce: I’ve had a pouch of miso in the refrigerator and have fallen in love with the salty flavor it adds to a dish which is why you might have noticed it in more recipes as of recent. You can leave it out of the sauce in a pinch, but try not to. I agree with you about the vegetable/rice ratio. More vegetables is much better! This is perfect! Thank you! I’ve been searching for a lo mein recipe! Can’t wait to try it! This looks soooo delicious. Thanks for sharing. Would using white miso negatively impact the recipe? It’s what I currently have in the fridge. I don’t think so- the flavor might just change slightly but would still be delicious!